For the Chinese President Xi Jinping, bringing about a ‘Toilet Revolution’ in his country is next only in importance to his international flagship project, the Belt and Road Initiative (BRI) involving the building of multiple ports, airports and highways linking China to countries across the globe. On the one hand, China has registered amazing progress in modernising its industries and cities, but on the other, its rural areas show comparative neglect. That is reflected in poor sanitary facilities in rural China. The Chinese State media have themselves described a typical village toilet as “nothing more than two bricks, one hole, breeding insects, and a fiery stink”. Bad domestic toilets have been a key reason for the poor health of the rural masses. Smelly and poorly-maintained public toilets have been threatening to deter tourist arrivals. About 4.3 million foreign tourists visit China annually. But many of these dread to come back because of the horrible public toilets they had had to use. Distribution of good toilets in China shows regional variations. The “penetration rate” of good toilets in the poorer central and western parts of China is lower than in those provinces in the east which are better off. Although the movement for better toilets dates back to the 1980s, it attained national centrality with President Xi Jinping himself adopting it as his own in April 2015. Xi told the 19th Congress of the Communist Party (CCP) that it should “resolve the contradiction between unbalanced and inadequate development and the people’s ever-growing needs for a better life”. Xi was alluding to the fact that China still has around 30 million living in extreme poverty. Xi realised that improving sanitation has knock-on effects on public health. The UN estimates that for every $ 1 spent on sanitation facilities, the spending on mitigating faecal-borne diseases like cholera can be reduced by $ 9. Given its all-round importance, the ‘Toilet Revolution’ has been comprehensively defined as “a step-wise campaign which tries to ensure hygienic separation of human excreta from human contact, to provide sanitary and comfort space for users, to prevent human excreta from pollution of environment, and to realise the resource recycling”. In Xi’s perspective, a clean and sound public toilet system is an explicit marker that divides a developing country from an advanced one. China may rival Japan in industry but Japan’s toilet technology marks its status as a truly advanced country. On 1 April 2015, Xi personally made written comments on a National Tourism Agency (NTA) report, instructing the agency to “seize” the ‘Toilet Revolution’ to combat “perennial maladies and ugly habits” and “upgrade tourism quality”. Such an explicit endorsement from Xi himself ensured that the ‘Toilet Revolution’ went “viral,” a leading international publication noted. Within days, the NTA released its ‘Three-Year Action Plan,’ which envisaged the building or renovation of 57,000 toilets in officially-designated tourism zones before 2018. The plan also called for improving the quality, cleanliness, accessibility, and female-male ratio of toilets. The absence of clean and functioning toilets has been worrying Xi since his early days as a party functionary in the rural areas. He had had personal experiences of rural deprivation when he was a ‘sent-down youth’ in the village of Zhaojiahe in Shaanxi province in the late 1970s. ‘Sent down youth’ are young people sent to the countryside compulsorily to experience the life of the deprived. This system lasted till the end of the Cultural Revolution. According to the book ‘Xi Jinping’s Seven Years as a Sent-Down Youth,’ Xi built the first gender-segregated toilet in Zhaojiahe. And when he served as a young cadre in Zhengding in Hebei province in the early 1980s, Xi led efforts to significantly improve the filthy local toilets. 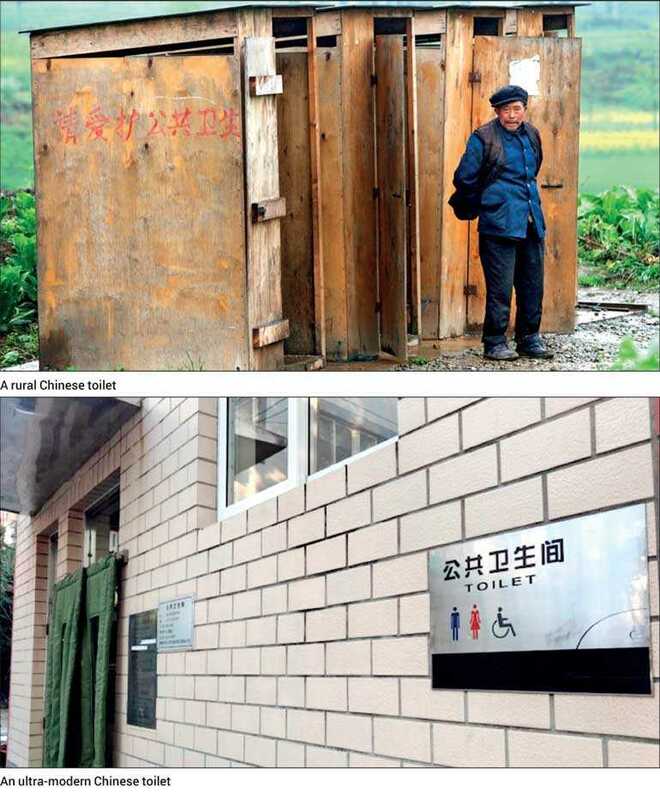 Even now, in his tours of the countryside as China’s Supremo, Xi would always enquire about the toilets and bathroom facilities in the villages, whether they had pit toilets or flush toilets. When Xi launched his ‘Toilet Revolution’ on 1 April 2015, more than 57 million households did not have their own sanitary toilets, though 40 million of these had access to a public toilet and 17 million households had serious hygiene issues resulting from poor toilets. However, it was not as if the pre-Xi toilet construction program had nothing to crow about. The coverage of sanitary toilets in rural areas had increased from 7.5% in 1993 to 78.5% in 2015, while the coverage of harmless sanitary toilets reached 57.5% by end of 2015. In 2015, faecal sludge collected in the urban areas totalled 14.28 million tons. Out of this, 6.76 million tons or 47.3 % was treated. In Beijing, the national capital, the treatment ratio of faecal sludge had reached 92.3%. Since bad public toilets in the urban and outlying areas were severely impairing tourism, it is no wonder that the tourism sector fired the first shot of the Toilet Revolution. In 2015, the China National Tourism Administration (CNTA) set a target of upgrading 25,000 public toilets and newly building another 33,500 in three years. It was later reported that 89.33% of the task had been finished by February 2017. As per present plans, the national coverage of rural sanitary toilets should reach 85% by 2020. The five developed municipalities/provinces including Beijing, Tianjin, Shanghai, Jiangsu, and Zhejiang will have reached 100%, with another twelve provinces reaching 82% by 2020. It was evident that education, water supply and sanitation were inter-connected. Therefore, steps were taken to inter-link elementary education, water supply, sanitation, and public health. The entire bureaucracy was made to act in a coordinated way. The NTA got central ministries involved in land-use rights to streamline processes to build toilets. Until May 2017, the top leaders of 27 provinces, autonomous regions, and municipalities had issued instructions and State requirements for local implementation of the ‘Toilet Revolution’. Many localities set up “small leading groups” to implement the policy. The NTA also held local tourism officials accountable. If the toilets were not up to the mark, they would lose ranking. In 2016, the NTA promulgated an evaluation system for “tourism toilet quality.” The NTA offered financial rewards and other awards to top performers. The mobilisation of resources and local enthusiasm have produced results. According to State media, between 2015 and 2017 the NTA was able to get the Ministry of Finance to allocate $ 254 million to subsidise toilet construction. This helped motivate local bodies to collectively invest a further $ 2.9 billion of their own budgets into toilets over the same period. In November 2017, the NTA announced that 68,000 toilets had already been constructed or upgraded, exceeding its original target by nearly 20%. The target for 2020 is 64,000. The new plan also extended the ‘Toilet Revolution’ to the thus far neglected western and central regions. The Government subsidises households which buy toilets. This has increased access to sanitary toilets from 7.5% in 1993 to over 80% by the end of 2016. Full coverage by 2030 is envisaged. According to the latest official document, toilets for rural households in the country’s eastern regions and mid-western city outskirts should “basically” go through pollution-free renovations by 2020. By 2020, around 85 percent of rural households in mid-western areas where conditions permit should have access to sanitary toilets. Toilet waste is to be “effectively” treated or utilised by 2022. The coverage of sanitary toilets in remote and underdeveloped regions should be increased “gradually” by 2020 and “markedly” by 2022, according to the guidelines. In some cities popular with tourists, such as Beijing, Haikou and Taiyuan, plusher public toilets have been built, offering bank ATMs, snack machines and Wi-Fi. Some toilets have also been expanded to include cubicles for the disabled, elderly and adults with young children. But officials have been warned not to lavish too much money on new facilities. While China is making rapid advances in sanitation, the rest of the developing world presents a dismal picture. In 2015, 946 million people still practiced open defecation. Globally at least 1.8 billion people use a source of drinking water is faecally contaminated. The World Bank estimates that poor sanitation costs the world $ 260 billion annually in terms losses due to poor health. Poor sanitation contributes to 1.5 million child deaths annually from diarrhoea, which is the second leading cause of morbidity and mortality among children under the age of five.